If you’re looking for something exciting yet different, host a blackjack tournament. Blackjack is a fun and exciting game that can be played at almost any event. This gaming event makes a great tournament for any type of gathering including work related events, community fundraisers or private get-togethers with friends and family. This game is one of the most popular and favored games played at most casinos. But unlike the casino version of the game, you’re not playing one-on-one against the dealer at a tournament. Instead, you’re playing against the dealer and the other players all at once. Blackjack events allow many people to play the card game at the same time. With these exciting events, you can also organize elimination or non-elimination games. In an elimination game, everyone plays at once. The players who win the lowest amount in each game are eliminated until only the top two or three players are left for a final shootout match. During a non-elimination game, no one gets eliminated. Every player participates in several rounds of the game to see who can win the most money. At Casino Party Experts, we have everything you will need to host this dynamic gaming event. Our blackjack tables are state-of-the-art, professional gaming tables. We can provide you with everything you will need for your event including official gaming cards, chips and play money for an exciting evening of intense excitement. Our play money can be given to each player to use instead of real money. We also have highly trained, professional dealers to oversee the games and instruct players on how to play in the match. 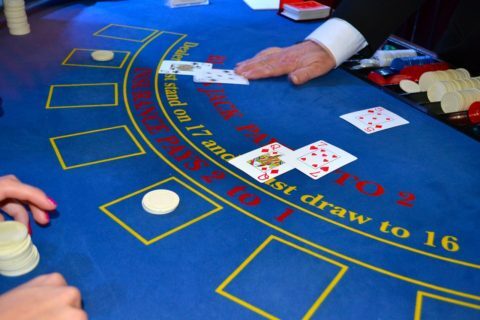 To get an estimate for your Blackjack Tournament party rentals, call us at (317) 857-0168. But we won’t stop there. At Casino Party Experts, we can help make your evening an extravagant affair. Our decorations and tables will transform your room into a glamorous casino venue. We have many accessories to help add to the excitement of your event. Depending on the purpose of your tourney and the size of your group, we can also provide many extras to add to the thrills of the party. We have an oxygen bar, red carpet, show girls, money box, an event photographer, professional DJ, a photo booth and slot machines to give help make your contest a successful evening. We also have other gaming tables and electronic activities to help add to the thrill of your evening. Your guests will have the time of their life as they participate in the exciting gaming action. If you’re looking for something fresh and exciting to do, host a blackjack tournament. At Casino Party Experts, we have everything you will need and more to help make your gathering a successful one. Give us a call at (317) 857-0168 for an estimate for your Blackjack Tournament party rentals.